Every year Singapore children’s charity Kidz Horizon raises money with an auction of timepieces donated by generous individuals. Set up to help chronically or terminally ill children from poor families, Kidz Horizon has sold some notable timepieces in the past, including a Voutilainen GMT-6 in titanium and a Audemars Piguet Royal Oak Skeleton in cermet and titanium. Last year’s auction saw a Greubel Forsey and Hublot go on the block thanks to a prominent local collector, the same gentleman who’s responsible for two of the three watches that will be sold on August 25, with the third having been donated by Franck Muller Asia. 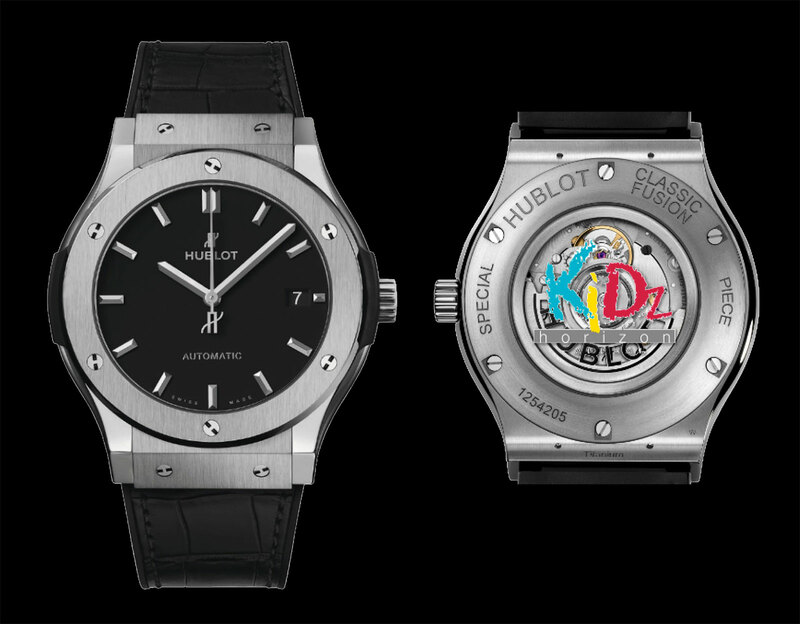 Pictured above, the first watch is a Hublot Classic Fusion 45mm Kidz. This is a “Special Piece” and engraved as such on the case back, being a variant of the Classic Fusion 45mm. The case is titanium and resin, while the dial is matte black, and the charity’s logo is printed on the sapphire crystal back. The indicative price of the Hublot, based on the retail price of the standard model, is S$8000, or about US$5800. 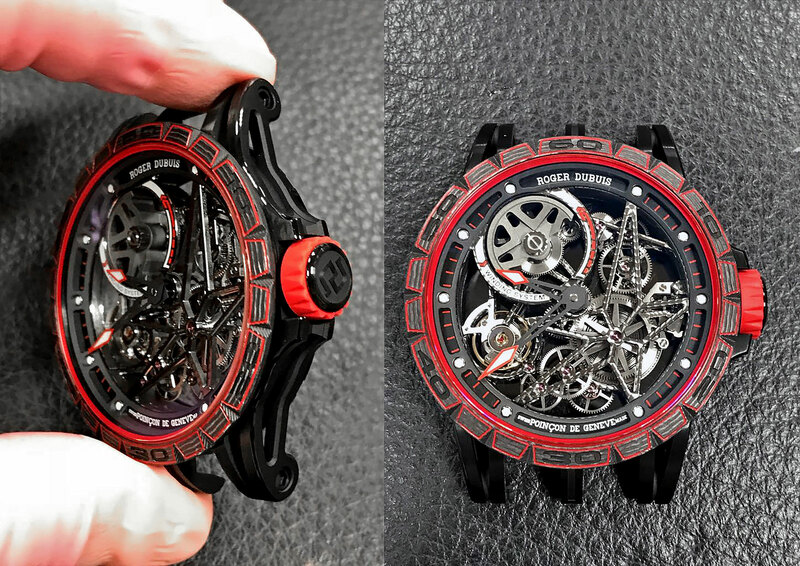 The second is Roger Dubuis Excalibur 45 Spider Kidz Horizon, a unique version of the brand’s signature skeleton automatic. 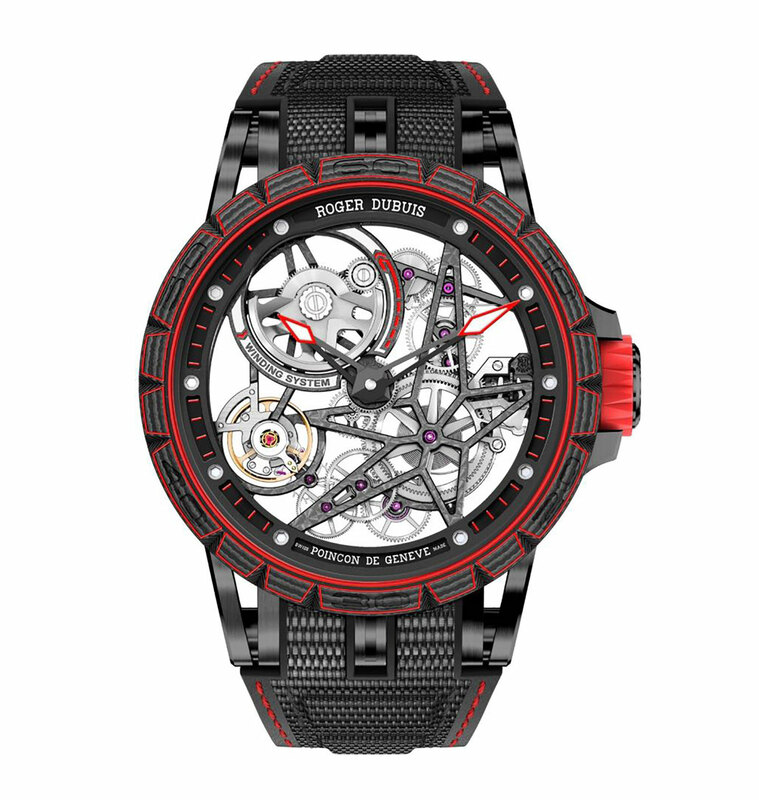 The lightweight, skeletonised 45mm case is made up of a case band and back of black DLC-coated titanium, while the bezel is carbon composite, a combination unique to this watch. The Roger Dubuis fresh off the watchmaker’s bench in Geneva. It’s powered by the RD820SQ, an automatic with micro-rotor that’s been open-worked to form a star, the trademark motif of Roger Dubuis movements. The case back is engraved “1/1”, indicating it is a unique piece. The indicative price is S$80,000, or about US$58,000. The final watch in the line-up was donated by Franck Muller Asia. It’s an example of the Vanguard Bronze, a limited edition of 28 watches with a brown dial and bronze case that’s available only in Asia. 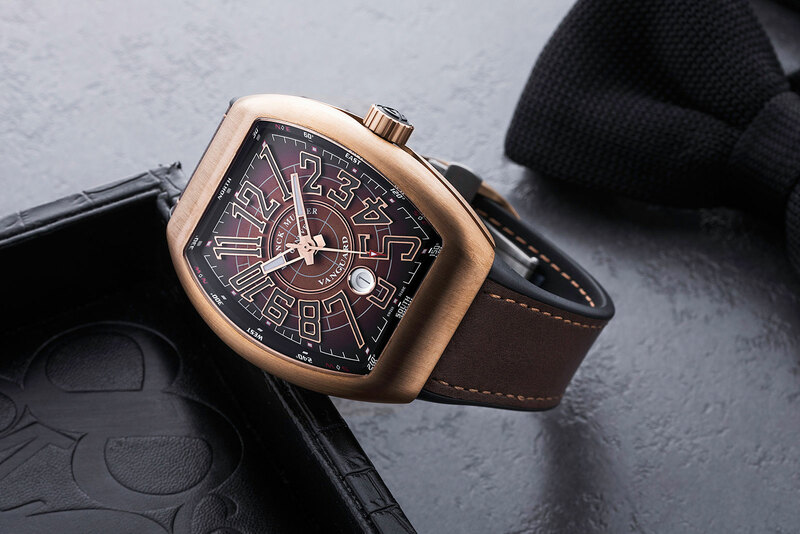 One of the bestselling Franck Muller models, the Vanguard streamlines the brand’s signature Cintree Curvex case by integrating the strap into the case, which is made of brushed bronze for the Asia edition. The indicative price is S$14,000, equivalent to US$10,000. The watches will be sold at a live auction during the Kidz Horizon Appeal gala dinner that takes place on August 25, 2018, at The Ritz-Carlton Singapore. To submit bids or donate direct, please contact Kidz Horizon Appeal via its website or email. Eligible donations are 250% tax-deductible for Singapore taxpayers. Jacob & Co. is best known for making jewellery – bona fide “bling” – that’s popular with famous names in entertainment and sports. 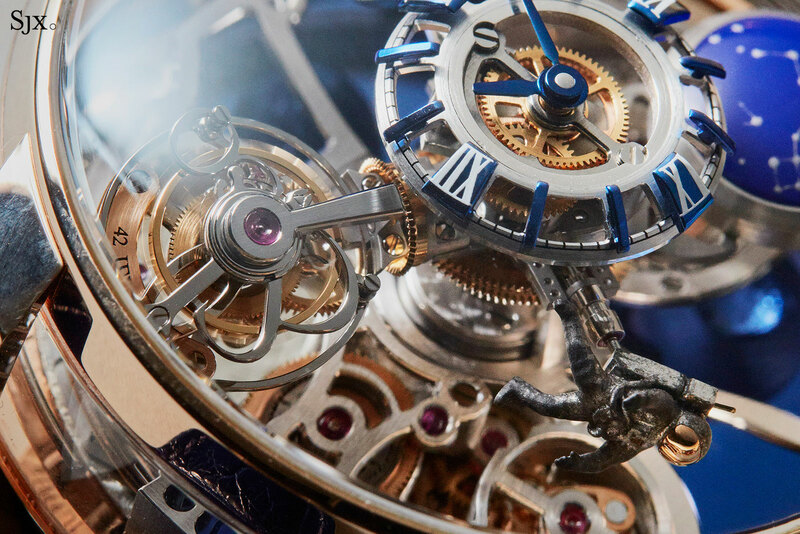 While the New York jeweller’s watches are not for the faint-hearted, the complications are interesting, both technically and conceptually, rare instances in modern watchmaking where over the top design is accompanied by equally inventive mechanics. At Baselworld this year, Jacob & Co. added to its long list of Uber-complications with not one but two minute repeaters. The first was the aptly named Twin Turbo Furious, a decimal repeater with a pair of triple axis tourbillons (which makes for six axes in one watch) and monopusher chronograph, while the second was the Astronomia Maestro. 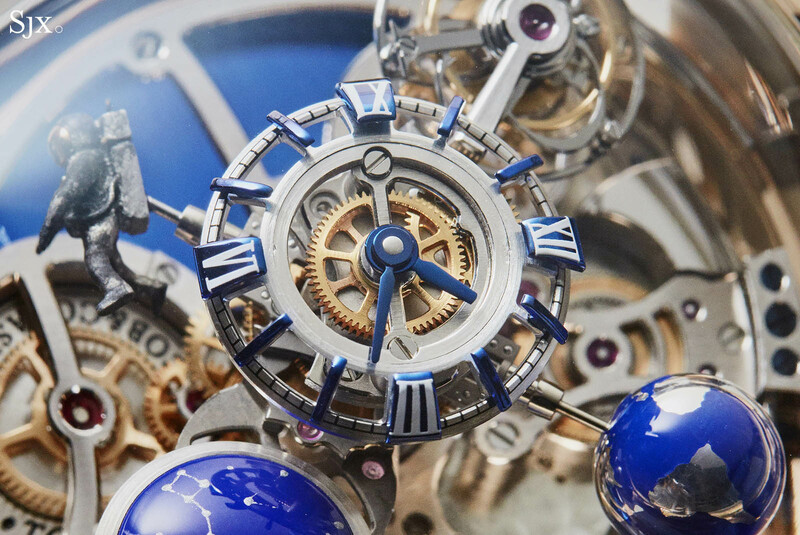 While both watches are visually astounding and impressive, the Astronomia is on an entirely different level of theatricality. The Maestro is the latest in the Astronomia series, which has become something of a signature for Jacob & Co. 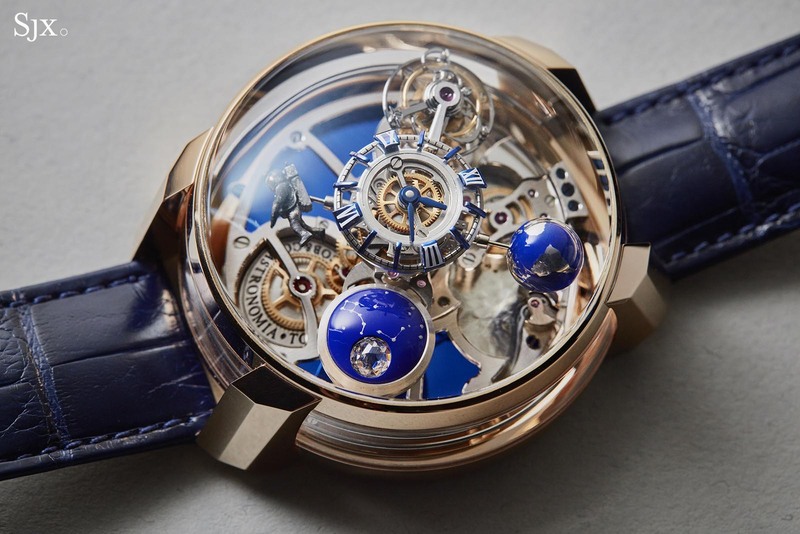 Oversized watches with a variety of orbital complications under a panoramic sapphire crystal, the Astronomia in its latest guise combines a triple axis orbital tourbillon with a carillon minute repeater. Conceived over a period of two years by watchmaker Luca Soprana and his complications workshop Ateliers 7h38, the outfit responsible for developing and assembling all of Jacob & Co.’s flamboyant complications, the Astronomia Maestro is a massive 50mm in diameter and 26mm thick. It is enormous, but it is as big as it should be; the watch looks right. 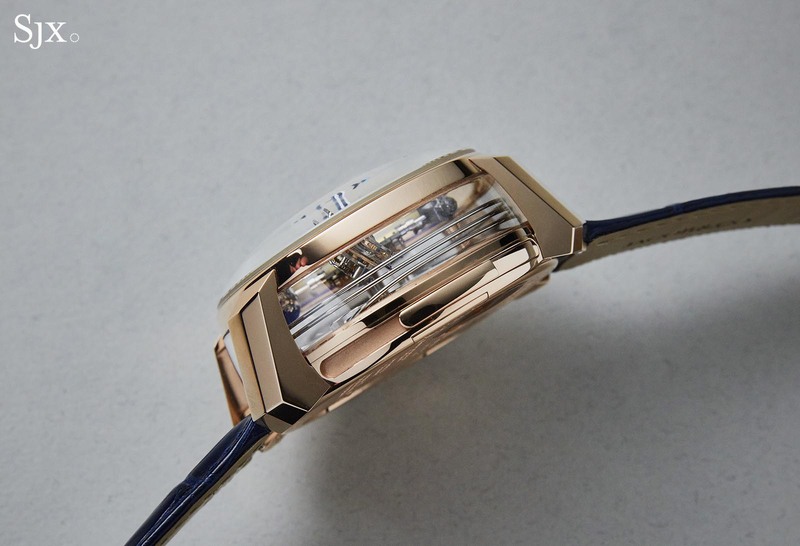 The case is rose gold with sapphire windows on the case band, offering an expansive view of the movement and the striking mechanism – and there is a lot to see. 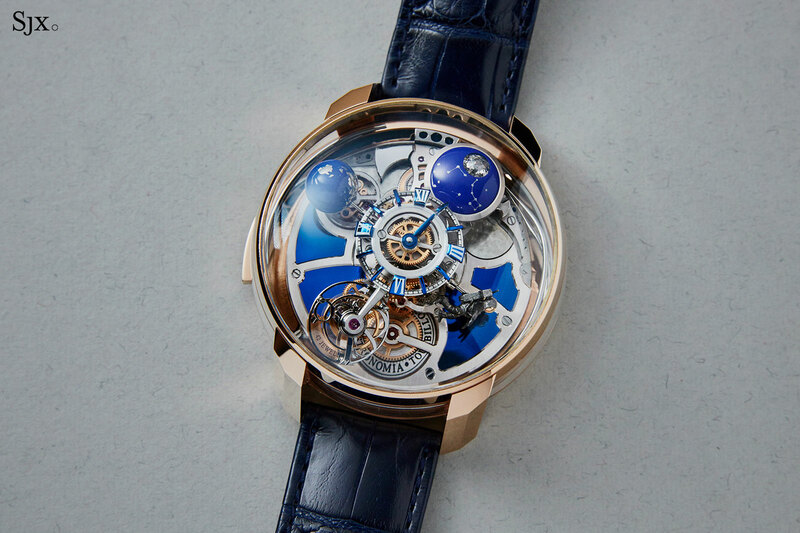 The fundamental premise of the watch remains the same as the other Astronomia watches: at the centre of the movement sits a four-armed carriage system that completes one revolution in 10 minutes, with various complications on each arm. But in the Maestro, the combination of complications has changed. The dial, which displays the hours and minutes, sits atop the central axis rather than its typical position on one of the arms, offering more intuitive reading of the time. On one of the arms is a moon phase disc that rotates on two axes, one being the 10-minute revolution of the carriage, and the other on itself over the course of 31 days. The moon is depicted with a 288-facet “Jacob-cut” diamond, composed of two halves: one side a black diamond and the other side a white diamond. On the next arm is, in essence, a highly elaborate seconds hand that takes the form of lacquered magnesium globe which rotates on its own axis once in 30 seconds, much like a barbecue spit, as well as simultaneously revolving around the main axis. 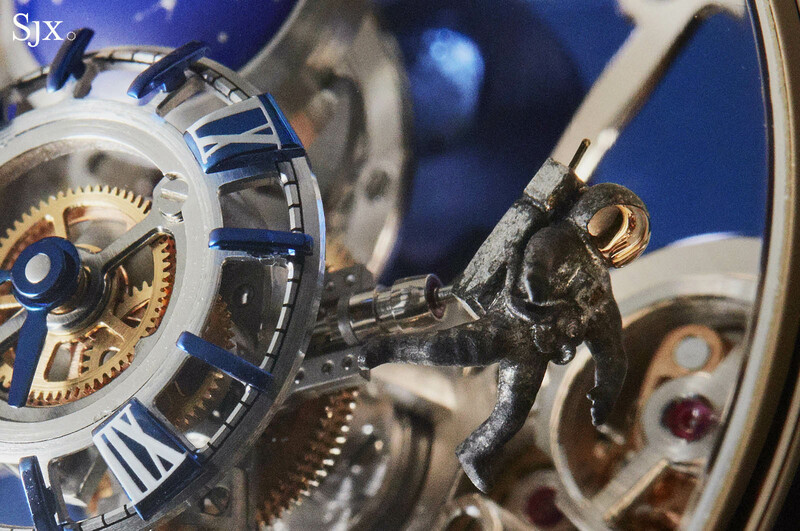 The opposite arm carries a tiny figure of an astronaut that spins on the same 30-second axis. Both also continue around the dial on a 10-minute revolution. The astronaut on the serial production watch will be painted silver. And on the last arm is the triple axis tourbillon, which has two cages, each making one revolution in 60 seconds and five minutes respectively, all the while completing the 10-minute rotation around the central axis. In addition to the assortment of complications, the spacious case is the perfect home for a carillon minute repeater. The airy space within the case allow for loud, crystal-clear sound, though the chimes of the prototype needed tuning. 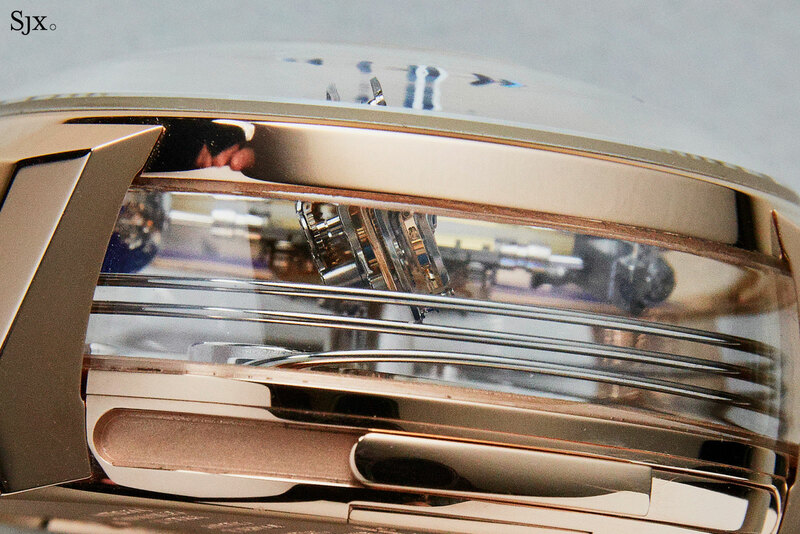 Though the watch is large, the repeating mechanism is surprisingly flat, being integrated into the back plate of the watch, with the gongs rising up towards the crystal. The minute repeater is activated via a slide mounted on the left side of the case. As opposed to a conventional minute repeater with two sets of hammers and gongs, a carillon has three of them. A low note sounds the hours, while the quarters are struck by a triple chime, and the hours a high note. The gongs are cathedral gongs to boot, nearly twice the length of conventional gongs, producing a richer, deeper sound with a longer reverberation. One of the challenges with building cathedral gongs lies in encircling the movement without touching each other, the case and the movement. 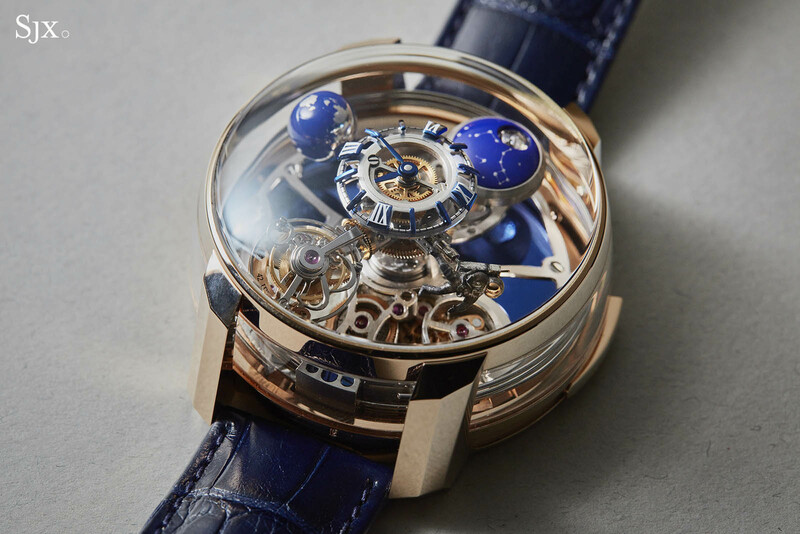 The three gongs in the Astronomia Maestro elegantly spiral upwards over the titanium base plate, which provide for a remarkable view from the side of the case. In addition, the minute repeater is powered by a patented, cone-shaped fusée barrel with a ratchet and pawl system. It also features a patented double safety system that protects the mechanism during a chiming sequence, disengaging the time setting mechanism, thus preventing damage to the movement if the crown is pulled out. 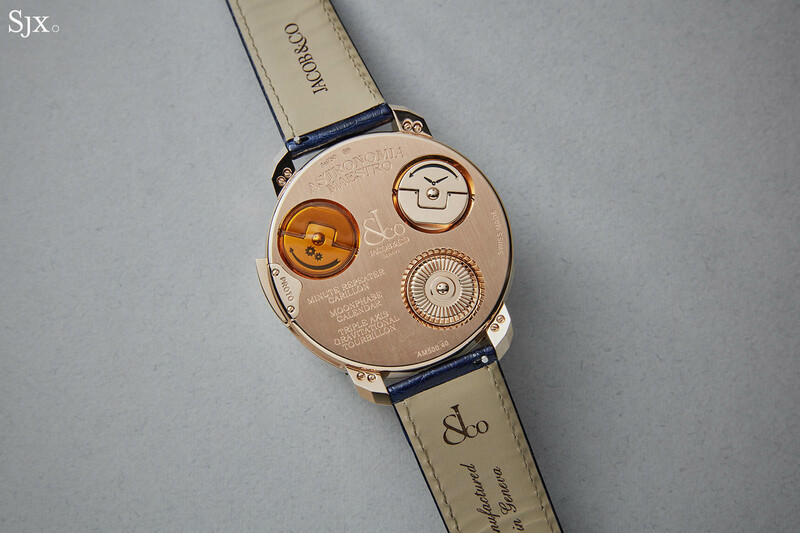 On the caseback are a pair of hinged tabs to wind and set the watch, as well as a rotating wheel at the bottom to set the moonphase. When fully wound, the watch will run for 60 hours. 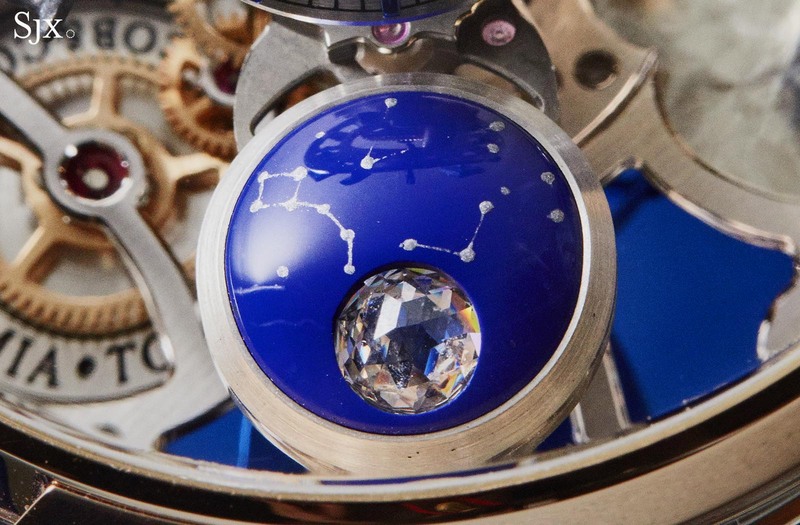 The Jacob & Co. Astronomia Maestro Minute Repeater (ref. AM500.40.AC.SD.B) is a limited edition of 18 pieces, priced at US$680,000. Correction August 14, 2018: The company responsible for the Astronomia movement is Ateliers 7h38, and not Studio 7h38 as previously stated.